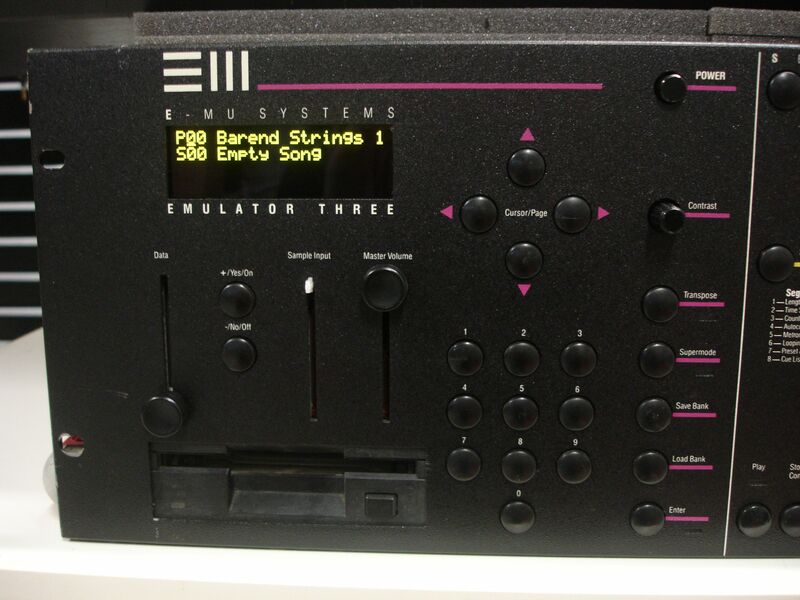 I purchased a beat-up EIII rack (quite rare) from eBay not long ago. It wouldn’t power up, but would just ‘clunk’ once per second. I replaced all of the electrolytic caps on the power supply, re-installed the supply, but had the same problem. I sent it to Nyco Systems, where they replaced some other caps, but it still didn’t boot. I soon discovered that the 120V/220V switch was broken, so I hard-wired the switch, and SUCCESS! It powered on and booted but the LCD backlight was almost dead, and a bunch of the switches didn’t work. I found a nice OLED display from Newhaven Display, and replacement switches from Digi-Key. It’s now working perfectly. EIII with a sharp new OLED character display. So how do you like it compared to the dss-1 for example (you know so well ) . Thank you for sharing your initial thoughts & experience Tom ! I have an emu Eii + being serviced right now (adding sd floppy emulator and doing an overall check up ), I hope to compare it to one of your Dss-1 soon -). No I haven’t played an EII, but I hope to have one someday – perhaps once I get more space in my garage…. I have an old Emu Emulator-IV that I use stand-alone with a keyboard. Now it needs repair. When I power up I get jibberish on the screen and no function. Anyone know where I can get this repaired? Depends on where you are located…. As for question to user for difference between EIII and DSS I believe its a world of a difference. I love the sound of the DSS (as well as the akai s900, prophet 2k, s612, s330, Emax 1/2…) I have found that the amount of time required to learn to program is beyond me currently (both the dss and the p2k can be tedious in programming properly). I usually use the DSS for the factory programs or use the wave generator. On the other hand: the Emu systems for their early samples (despite a few personal quirks) are a dream to program. If you have the money tracking an EIII down is certainly worth it, but you cannot go wrong either with an Emax or Emax 2. 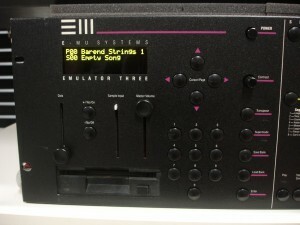 Programming on the Emu is a dream for a hardware sampler. And as Tom said the EIII is much cleaner sounding, also has 16 individual outputs, built in scsi, strong community support for samples, etc. Not sure the EIII ever gets gritty or dirty sounding, but not sure thats what its intended for and personally that is why i have an emax and an s612 and occasionally the DSS1. Yes, that’s the same part that I used on my display. They have them in green or yellow. You need to take apart the front panel, the old display needs to be desoldered from the header, and the new one installed in the same place. So, philips screwdrivers, small and large, soldering iron, desoldering pump or station. Some flush cutters to trim the ends of the wires from the backlight inverter, or you could remove the inverter altogether. Did you have to make some modifications on EmulatorIII chassis and front panel PCB’s to fit the new OLED display (screw holes, spacers, etc…)? Is wiring pin to pin compatible? Looks great, btw 🙂 Nice work! I have Emulator III keyboard, and blue OLED would look great on it. With the display I used, no modifications were necessary. You can remove the EL backlight inverter module if you want to. The blue OLED must be new, I haven’t seen that one before. I tried looking for a new display for my own Prophet VS, but the display configuration is not all that common it seems…. Tom, thank you for your quick reply and for information. As for the OLED display for Prophet VS, why do you think display configuration is not all that common? 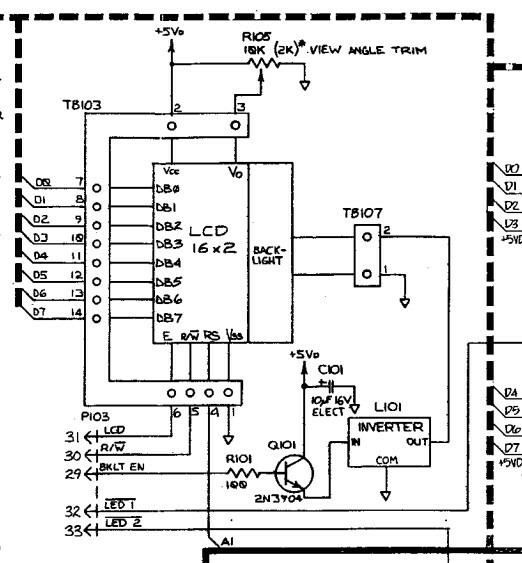 As I see on VS schematics it’s a standard 8-bit parallel LCD and it perfectly fits Newhaven 16×2 OLED. My problem with Newhaven is 40$ shipping price for one display to my country (Croatia). It’s quite stupid to pay almost twice for shipping than for item itself so I’ll probably buy all three displays at once (EIII, VS and K1200) as shipping price for three displays is almost same as for one. 91$ (displays) + 42$ (S/H) + 35% customs TAX and VAT in Croatia = 185$!! So, I would like to be sure if displays are compatible before I buy 🙂 If it’s not so expensive I would buy a bunch of their displays and test them all on various synths and studio equipment. I recall looking for an OLED replacement for the Prophet VS and at that time Newhaven didn’t have a compatible display. It looks like they might have one now. I’m currently in the middle of moving to a new house but once that’s done I”ll be able to research the display some more. The VS uses a 16×2 display which is 84mm x 44mm, which is not that common. Also the connections are on the bottom left of the display. Newhaven does not have an OLED display in this format (although they do have them for LED backlit modules). There are a few other manufacturers like Winstar that have them in 84mm x 44mm. Other displays could possibly be adapted but new mounting holes would have to be made. If I disconnect the inverter, then I need to find another 5v power lead correct? If you’re retrofitting an OLED display, you don’t need to find 5V, it is already on the 14 pin header. You can just remove the inverter. sweet, so the 5v was just for the backlight on the old display..did you cut the inverter then? Do you remember where it was? FYI, I have a OLED retrofit in my Prohpet VS….I know you were looking into that. The inverter was a module not too far from the display, I desoldered it. You can follow the tracks from the EL backlight leads to the inverter. We used a NewHaven Display. Part number is NHD-0216KZW-AB5. I will have to go check out the test mode to see if it has the same limitation. Completed one of my two eiiixs displays last night. Pretty easy replacement. Left pin 3 out. Amazing results, its like owning a brand new Emulator. would you ever be willing to sell this beauty? thanks!! Not in the near future, maybe one day. who knows, maybe one day? Not right now though. Don’t wish to bother you much with my slightly unrelated question, but would you happen to know an maintenance expert or repair personnel for Emulators in Japan ? I have an EIII unit which needs some attention, but since the prices for shipping abroad are prohibitive, was hoping to seek help locally. Any guidance would be much appreciated. And thanks a ton for sharing your experiences. Ko Okatake, modeless factory and you can find him on facebook. Now it shows me only scrambled characters, i’ve read online about an HEX inverter substitution with SN74LS04N, 74HC04B1 but in my case it doesn’t work. I’ve read also about a 4n7 cap between pin 1 GND and 6 ( module enable) but also this doesn’t work.